There's a past-is-prologue quality to a lot what wwwtxt curates and sends out over its Twitter feed, exemplified by this nugget published on Friday. wwwtxt is not a bot. It's Daniel Rehn, an artist and "media archaeologist," who culls discussions before 1995, the beginning of the commercial Internet as we know it. The sources include Usenet discussion groups, the early online services (like GEnie, CompuServe and Prodigy) and the like. What's amusing about this, which is 19 years old, according to Rehn, is how specific it is in describing what we've learned to live with today: "New weapons and new game scenarios." 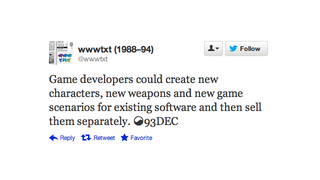 It sounds like a great, wide-open way to extend the life of a good game and add value, doesn't it? But I guess no one foresaw locked-on-the-disc DLC at the time, or DLC developed concurrently with the main product. Maybe Rehn can track down the first Internet complaint about DLC. Thanks to reader Christopher M. for pointing out the tweet.